From how our company began to how to plan a romantic final night in Paris, we have the answer to your questions. Learn more about every aspect of the Paris Perfect vacation experience. How did Paris Perfect get started? How do we know you are a legitimate company? I've always stayed in hotels in Paris. What are the advantages of staying in an apartment? Is a Paris apartment the right choice for me, or a Paris hotel? What makes your Paris vacation apartments so great? Are the apartments centrally located? Close to landmarks, monuments, fashion boutiques and restaurants? Do you also recommend good, affordable restaurants near the apartment where Paris locals dine? Are the neighborhoods that surround the apartments safe? Most of the apartments we've seen elsewhere face the inside building walls. Yours are primarily on upper floors with Paris views. Why do you think it's important? Do your vacation rentals have elevator access? Are the apartments fully equipped or do we need to bring anything? What channels does the TV receive? Do you provide electric converters and hairdryers? We've been told that most agencies use outside contractors and call them 'their full time' agent in Paris. They aren't always available, don't know the apartments well and have to ask for permission to make the smallest repair. What about your company? I love the idea of shopping at local open-air food markets and preparing meals in my apartment. Are the best markets nearby? Are the pictures of the Paris apartments and views accurate representations of what we will be renting? How do you help us to enjoy our stay in Paris? May we contact previous guests of the Paris apartments for references? Would Paris Perfect like to donate a stay in one of the properties as an auction item to raise money for our charitable cause? Are the rental prices of the Paris apartments all-inclusive? Are there any hidden costs? What is the Accidental Damage Waiver? What is the Key & Cleaning Deposit? What if we have a very early or very late arrival? How early can we check in? Once we arrive in Paris, how do we get in? Is there someone who to greet us, explain how things work, give us tips? Can you provide a crib for our baby and recommend a reputable babysitting service? We have allergies, are your properties smoke, dust, feather, fragrance and pet-free? Do you have any travel tips for our stay in Paris? What's the best way to get to our apartment from the airport or train station? What if there is construction going on next door? Will there be any construction work that might disrupt my stay? What kind of weather should I expect and how should I pack? Can you recommend a concierge service who can book tours, restaurants and more? I'm coming to Paris to celebrate a special birthday/anniversary/occasion. What can you do to make my stay in Paris simply unforgettable? I'm planning a romantic honeymoon in Paris. How can you help? Where are the best shopping spots in Paris? Can you recommend any cooking classes in Paris? Where can I take French lessons in Paris? How do you get around in Paris? Advice on Paris transportation. Advice on tipping in France? Information on museums and tickets? Did we forget to answer something? Paris Perfect is a luxury Paris apartment rental business that has grown from one special Paris rental to a handpicked selection of special properties. The idea began in the late 1990’s when Frenchman and former cardiac surgeon, Philippe, traded in the operating room for more entrepreneurial pursuits. He and his American wife, Maddy, had the idea to share their love of Paris and "la vie Parisienne" with visitors by providing beautiful apartments to rent in their favorite neighborhoods. We invite you to read more about how we got started and the Paris Perfect philosophy on our About Us page. What makes Paris Perfect special is that we have engaged a French operating company which manages the apartments in Paris with full-time employees. Guests are assured of the highest standards of cleaning and maintenance and the security of friendly, helpful staff nearby to solve any problems or answer any requests. Guests tell us again and again how they appreciate the extra service and attention. Learn more about Paris Perfect rentals here. We personally select the apartments with care. We have a long checklist of ‘must haves’ including remodeled kitchens, bathrooms, prime locations and quality furnishings. As you browse through our website you will see the beautiful apartments we have chosen, especially the charming features and neighborhoods, located near sites and landmarks that you can walk to. Why not contact our friendly Paris reservations team and reserve a Paris apartment to experience the real "Paris Perfect". 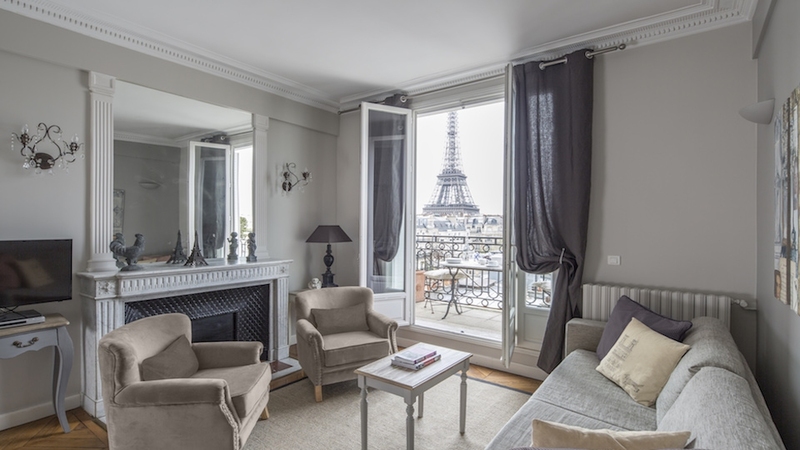 Paris Perfect is one of the few rental agencies to assure that the apartments they represent operate in accordance with the rental regulations in Paris. This means many of the apartments have obtained commercial zoning, a difficult-to-obtain license that allows them to operate a vacation rental 365 days per year. Others are primary residences and can be rented four months per year. We’re proud that our vacation rentals have been featured in numerous leading publications, TV features and magazines such as Forbes, Architectural Digest, The New York Times, Travel + Leisure, Business Week Magazine, The Wall Street Journal, Rick Steves’ Paris and France travel guidebooks, the Sydney Herald and The Fine Living Channel and on HGTV’s House Hunter’s International. We welcome you to read what the media says about us! Our best advocates are our previous guests, we invite you to read their hundreds of comments and opinions about staying at Paris Perfect on our Reviews Pages. We believe that staying in an apartment rental is the only way to travel and our multiple returning guests agree! Most hotel rooms in Paris are very small and everything costs extra. We provide the most competitive prices, free WiFi and in most apartments free unlimited phone services to most foreign countries. You’ll also be welcomed with a complimentary welcome basket that includes a bottle of wine and starter amenities on arrival. When a glass of Coke can cost $15 at in a hotel bar, the benefits of having a beautifully furnished apartment that includes a kitchen, a comfortable living room to relax, and gorgeous views becomes obvious. At home but never alone: when you reserve, we offer you a list of personally curated fabulous Paris resources, including restaurant recommendations and things to do. We can also recommend an excellent concierge staff to help plan your stay, recommend tours, day trips, cooking classes and more. When is a hotel the right choice for our Paris trip? Renting a vacation apartment isn't for everyone. If you are someone who needs room service, a front desk open 24x7, and daily maid service, or if you have disabilities that require specific adaptations, you may wish to consider whether a rental apartment is for you. However, if you relish the idea of living like a Parisian in a beautiful location with all the comforts of home, then a Paris vacation rental could be an ideal choice for your vacation. What makes Paris Perfect vacation apartments special? Simple: we want you to enjoy an unforgettable Paris stay, which means we’ve found the best apartments in the heart of Paris where you can savor and enjoy your stay from the moment you step through the front door. We’re so demanding that we might work with an owner for a year or more to remodel their apartment to our standards. We strive for the best location, the best apartments and the most friendly people!. Are the apartments in the center - close to the museums, monuments, fashion boutiques and restaurants? Absolutely! Since your vacation time is precious, we want you to stay in authentic Paris neighborhoods in the center so you can walk to most everything – from wonderful fashion boutiques, to open air markets, museums and excellent local, authentic restaurants. You'll love experiencing the authentic Parisian lifestyle, shopping at a nearby market for the best Camembert cheese, wine and paté to eat with a fresh baguette and salad, before heading to visit an exhibit at a nearby museum. Most Paris Perfect apartments are a stone's throw to the Musée d'Orsay, the Louvre, the Rodin Museum, the best Paris open-air markets, the Eiffel Tower, the famous rue Cler market street, Bon Marché’s department store and its food hall “ La Grande Epicerie”, the romantic Seine river and, of course, the trendiest shopping in Paris. Excellent local bistros, cafés, that the locals frequent and fine dining surround you. The apartments are a short walk to the local Metro, RER train and bus lines so when you want to visit outer arrondissements, such as Montmartre or have a picnic at Versailles, they are easily accessible. Do you also recommend good, affordable restaurants near our apartment where Paris locals dine? Of course! When you reserve an apartment with Paris Perfect, we'll send you our detailed 50-page information packet with a long list of our favorite restaurants, cafés and markets surrounding your apartment, along with local anecdotes about the owners and the restaurant reputations. Our guests love reading it and tell us they’ll need to come back to visit them all. Are the neighborhoods surrounding your apartments safe? Yes, this is important to us. The neighborhoods surrounding the apartments are among the finest neighborhoods in Paris, so you’ll feel comfortable taking evening strolls after dinner. We carefully choose the apartments we offer based on their locations in neighborhoods where we ourselves feel comfortable walking around at night. The Paris apartments have buildings with digital code panels outside and most have locked inner lobby doors. The apartment doors are steel-reinforced for extra security with the best quality locks. Most of the apartments come with a safe where you can store your valuables. Many of the apartments we've seen face the inside building walls. Yours are primarily on upper floors with Paris views. Does it make a difference? We believe that every moment of your vacation is precious, to be savored and enjoyed to the fullest. Most of the listed apartments offer spectacular views, making you pinch yourself that you’re really in Paris when you wake up each morning. These apartments are scarce and we smile when agencies turn inner-facing apartments into advantages by mentioning how quiet they are. For Parisians, the apartments facing the inner courtyard where the trash cans are stored are less desirable than outward ones. That said, we do have some inner facing apartments that are nice and are well-priced, great if you are traveling on a tight budget. Please note: Most of the apartments are located on the most desirable upper floors with beautiful views of the city and Paris monuments. For example, a few of favorites are the Bergerac luxury Paris apartment, the Champagne, the Margaux. However, we also offer a few budget priced apartments that are similar to most Paris offerings that are located on inner courtyards, such as the Saumur. They offer good value, especially compared to tiny hotel rooms in Paris. Plus, they have the added advantage of kitchens, living and dining areas. They receive good reviews from our guests for their amenities, location and value. Do the apartments have elevators? Since nearly all of the apartments are located on upper levels for natural light and excellent views, it is important to us that they have elevator access for your comfort. 95% of the apartments have elevators, the description of each apartment details whether there is an elevator or not but don’t hesitate to ask if you need guidance. Important: An historical note is that most elevators were installed in Paris buildings long after the buildings were erected, meaning there are often space limitations. Most Paris elevators are smaller than you are used to, and some are extremely small, with a capacity for 1 person, 1 suitcase at a time. If you have any questions, concerns or needs, please contact us for more information. We are pleased that the majority of the apartments have the benefit of air conditioning. It’s a rare feature in Paris apartments and even some hotels. Check for the specifics on the on the individual apartment page. Because most of the apartments are in historically protected buildings, air conditioning requires mobile units. They are very efficient, although they don’t always cool to the sub-zero temperature of US buildings. Our vacation rentals also offer fans for those in-between days. Read our important primer on air conditioning here. For more details about specific apartments, please don't hesitate to ask our Paris reservations team. The apartments are located in the center of Paris, which implies busy neighborhoods. The good news is almost all apartments windows have double-glazing (please see each apartment description for details) - the same used by luxury hotels. As a result, most of the apartments are extremely quiet. We believe you get the best of both worlds: a fabulous view and a good night's sleep. If you are a very light sleeper, please don't hesitate to ask which apartments we would recommend. Are the apartments fully equipped, or do we need to bring anything? We want you to feel at home in Paris the minute you arrive, so the apartments are equipped with everything from bed linens to towels, appliances, good dishes and complete cookware. Wherever possible, large refrigerator/freezers, ovens, separate microwaves (or combination microwaves/convection ovens when space is restricted), washer/dryers, toasters, coffee makers, espresso machines, luxury linens, towels, shampoo, conditioner, liquid soap, body lotion, WiFi and even hotel-style safes are in most apartments. Each apartment has converters for your laptop computer. We describe each apartment in thorough detail on our site. In addition, we provide a starter supply of a few grocery items including a bottle of wine, a large bottle of water, orange juice, and enough coffee capsules, toilet paper, paper towels, tissues, dishwasher, laundry and dish soap to get you through the first couple of day of your stay. Supplemental maid service and linens are available with advance arrangement, please request a price quote. If the property description indicates satellite TV, it will receive a few English language news channels. Depending on the subscription, it may or may not include CNN, BBC, MSNBC, SkyNews. It is unlikely it will receive any English language entertainment channels since these premium channels are not included with basic satellite service. Yes, hairdryers are in all apartments as well as plug converters for your personal electronics. Information about Converters and Adaptors in Europe: Voltage is France is 220 V compared to 110 V in the U.S. Some appliances, such as electric curlers or American hairdryers need converters. However, laptop computers and tablets already have converters (the heavy box in the middle of your cord) so no need to worry there. We hoped you would ask! This is what sets us apart from most companies and even hotels. The advantage you have in renting a Paris Perfect Apartment is that you are dealing directly with us, the exclusive managers. Our philosophy is simple: if it needs fixing, let us know and get it done as quickly as possible. As a result, small appliances can be changed or most repairs can be done within one business day. The employees of the local operating company all speak fluent English and will help any way they can - from finding a good doctor who makes house calls, to recommending a private chef or hairdresser. They have even helped a guest locate a lost child. Our guests tell us that this personal service is what makes us different, and the reason they come back to Paris Perfect year after year. Do you use outside contractors to clean and maintain the apartments? We use a French operating company that manages the apartments in Paris with full-time employees and an office. There’s no replacement for a reliable management company with a head of housekeeping and also full-time maintenance engineer. Guests are assured of the highest standards and the additional security that helpful staff is nearby to solve any problems or answer any requests. The results speak for themselves, guests tell us time and again that the apartments are the cleanest and nicest in Paris -- these are the words we like to hear. I love the idea of shopping at local open-air food markets and preparing meals in my apartment. Are the best markets nearby and apartment kitchens fully equipped? Shopping at the local open-air food markets and local food shops is one of the nicest treats when renting an apartment in Paris compared to staying in a hotel. For Parisians, food is one of the most pleasurable pastimes. Equally important, guests save money when they stay in an apartment since they can choose between meals you prepare at home and dining out at local restaurants. When you reserve, our information booklet includes all our favorite local boulangeries, boucheries, fromageries, patisseries and open markets in the neighborhood so you can sample and enjoy. Just walk by any bakery and see the artful displays of bread, pastries and chocolates and you’ll agree! The kitchens in the apartments are completely remodeled and outfitted for your comfort and convenience. You’ll find everything you need to prepare and enjoy a home-cooked meal while surrounded by elegant and modern design. Just take a look at the slideshow photographs of the apartments and you’ll see the attention to detail and pretty touches in each kitchen. Yes, the apartment pictures are updated regularly. The stunning views from the living rooms and balconies stand out for themselves. Importantly, the apartments undergo regular maintenance and repainting, making improvements during the quiet months. This way there are no surprises when you walk in the door of your apartment. The soft furnishings (cushions, throws, bedspreads, curtains) are changed on a regular basis and replaced with clean ones while trying to maintain the overall look and feel in the apartment. Guide to the local Parisian open markets with opening hours, etc. You can also browse our website for more information about our favorite Paris neighborhoods, such as the articles about the 7th arrondissement in Paris, all about the 6th arrondissement in Paris and more. We will also recommend a reliable taxi driver. Absolutely! We have a large guestbook on our site which former guests can access directly and leave comments. Many leave their names and email addresses so you can contact them directly. Would Paris Perfect like to donate a stay in one of your properties as an auction item to raise money for our charitable cause? Thank you for thinking of us for your charity fundraising efforts. As a company, we contribute to annually several charities that mean a lot to us. If you have a request, we are happy to work with your organization's members and contributors if one of them would like to sponsor a stay and underwrite the cost. Paris Perfect will work with the organization or contributing member to define the value and terms. We can provide a voucher along with photos and copy for the auction catalog in the name of the contributing sponsor after terms have been agreed and payment has been received by Paris Perfect, so the underwriter can then donate it as an auction item. Are the rental prices of the Paris apartments all-inclusive? Please note that normal utility usage is included. We kindly ask our guests to switch off the air conditioning or lower the heat when they are out of the apartment for several hours because electricity prices in France are very high. In a few cases, guests have left windows open while the air conditioning or heating was running, which led to extremely high utility bills. We were obliged to charge them for the excess charge. However, we have never taken advantage of a guest with unfair charges. We pride ourselves on offering fine properties with nice furnishings, antiques, fine linens and top-of-the-line appliances. We want you to feel at home and enjoy every moment of your stay without worrying about any "What ifs?" should something happen. Because accidents happen, our goal is to ease your mind by minimizing your costs if they do. In order to make your stay as worry-free as possible all guests are required to purchase a non-refundable Accidental Damage Waiver that covers you for accidental damage and/or breakage up to 1,500 Euros per stay. The damage waiver price is €49 Euros for properties with a nightly rate up to €300 Euros and €59 Euros for all other properties. For the majority of the properties, the greeter will swipe your credit card to obtain a “pending” transaction. The amount is in the range of €300 but varies by property; please refer to your booking confirmation email for further information. After you depart, the property will be checked to confirm it was left tidy, there was no malicious damage or loss of items such as keys. If all is well, your card will not be charged. In the unlikely event of loss, malicious damage or extraordinary cleaning, your card will be charged for the amount to cover the costs. What is your minimum length of stay in your vacation apartments and are they Saturday-to-Saturday arrival only? Our minimum stay depends on the season and availability. We work typically work with a 5 to 7 night minimum, although for last minute travel, shorter booking periods are sometimes possible, please contact us to ask. Please contact reservations and we'll be happy to assist you. How far ahead should we book our stay? The best apartments with balconies and views are booked up to a year in advance, often by returning guests. We recommend that you contact us for availability as soon as you have an idea of your vacation dates. Guests often select an apartment which we will hold for them for 24 to 48 hours to provide time to confirm flights. Please don't hesitate to contact us and ask. Please contact us to confirm availability, and we'll help you plan your stay. Once you decide to book, we will send you detailed instructions on the next steps. We ask for 50% payment to confirm your reservation and the remainder of the payment plus key and cleaning deposit 90 days before arrival. If you are arriving within 90 days, full payment is due upon booking. On receipt of deposit, we will send you detailed information to enjoy and to help you prepare for your trip, including arrival information and tips, apartment instructions and lists of fun things to do in the neighborhood and in Paris. For more details on payment and booking one of our Paris vacation rentals visit our Terms and Conditions page or simply email us. What if we have a very early or very late arrival? Check-in time is officially 3:30 pm, similar to hotels, and check-out time is 10:00 am. However, we know that international flights often mean that guests arrive early, and we do all we can to accommodate you. If you have a flight arriving extremely early in the morning, we recommend you rent the apartment the previous day so that you have the assurance that the apartment will be ready for check in as early as 9:00 am. If you prefer not to reserve the night before for check in as early as 9:00 am, and the apartment has guests checking out that morning, the local operating company in Paris can store your luggage, so you can go out and shop for essentials. You can then start exploring Paris by enjoying a good breakfast or lunch, then return later to check in. Once we arrive in Paris, is there someone who speaks English to welcome us at the apartment, explain how things work and give us neighborhood tips? Yes, it is the personal English speaking welcome that sets us apart and will make you feel at ease on arrival. Once you book your Paris Perfect apartment, we’ll recommend a trusted taxi service to pick you up at the airport and bring you to the apartment. They'll even call the greeter for you to say you’re on your way. When you arrive a friendly greeter will be there to familiarize you with the apartment features. When you arrive in a different country so many things are different, even the door locks. This kind of help is the ideal way to arrive and to start enjoying your stay. Features such as entry systems, hallway lights and keys which can be a little complicated the first time round, become so easy to operate when someone shows you how! For example, we’ve heard of stranded guests who arrived at their apartment and couldn't get in. After trying to reach their "local contact" who did not pick up, they had to check into a hotel until they could reach offices in America. We prefer to help start your Paris vacation off in the best possible way by greeting you with a friendly smile and answering as many questions as you may have! We have young children; can you provide a crib for our baby and recommend a reputable babysitting service? Yes, we can provide a porta-crib and linen with advance arrangement at no additional charge and recommend an excellent babysitting service. Please be sure to ask before your arrival if we can help make your holiday in Paris with your children more comfortable and enjoyable. I'm sorry, but the apartments rentals are non-smoking. I'm sorry, but we do not allow any pets. Some of our guests may have allergies and we try to provide an allergen-free environment. We prefer to represent non-smoking and no-pets properties for the comfort of our guests but we can't guarantee that our properties are allergen free. There are a wide array of factors out of our control that can be allergen or asthma triggers: laundry soap, fragrances, cooking smells, nearby pets, mildew in ancient buildings, or a neighbor who smokes for which we cannot be responsible. Some properties have down feather bedding, pillows and upholstery stuffing, we cannot guarantee the ability to provide synthetic substitutes. If you need special pillows, duvets or linens washed in fragrance-free laundry soap, please request a price quote in advance of your stay so that we can see what is possible, and if necessary, purchase for your special circumstance, the cost for which will be added to invoice. In a few cases, we do represent properties that will allow a small pet, subject to an extra security deposit. Please ask about the policy if it’s not stated on the property description. What is your cancellation policy and rental terms? We know that accidents can happen and problems sometime arise, which is why we strongly recommend you purchase travel insurance for your trip. We have used Travelex ourselves and found it inexpensive and comprehensive. We recommend it for guests. Cancelling more than 60 days before arrival date: Payments made are fully refundable, minus $250 USD administration fee and the applicable fee charged by the bank to process the refund. We strongly encourage you to take out travel insurance in the event that you must cancel your trip, or have problems while travelling. We can refer you to our reputable travel insurance provider Travelex, they offer a comprehensive travel insurance that covers most eventualities. You can also visit our Paris Perfect Blog as well, where we share stories, photos, information recipes and travel tips for things to do in Paris. Or subscribe to us on Twitter and Facebook for current updates about Paris. When you reserve we recommend a trusted taxi service who we have worked with for years. They can pick you up at the airport, call our greeters to let them know you’re on your way and then drop you off at your apartment or our welcome center. What if there is construction going on in the building? If there is construction going on in the building we will let you know as soon as possible. Unfortunately, owners are not required to let other owners know about planned building works and there are times when we have no advance warning. This is frustrating for us, and we do our best to stay informed. If it does happen, we promise to work with you to find the best solution for your particular situation. We honestly have no way of knowing in advance if construction work or elevator repairs could be underway in the apartment building or neighborhood. In our many years of business we have occasionally received word in advance of building works and have found the information about the timelines to be totally unreliable – works scheduled to start a certain month get delayed for years, caught up in bureaucratic red tape with the condominium association or awaiting building permits. Other times we learn of scaffolding going up overnight on a building because plaster has unexpectedly fallen off, creating a hazard to pedestrians below, and permits are issued immediately for emergency repairs. As you can imagine, in a city where buildings date back centuries, building repairs are ongoing and unpredictable. If we receive advance notice we will notify you, however on arrival if you encounter construction work in the building’s common areas or in neighboring apartments or buildings, or street repairs, we are very sorry, but this is does not constitute grounds for cancellation of your reservation. Paris' climate doesn’t usually have the extremes of some cities such as Boston or New York. While it is warm in the summer and cold in the winter, it is rarely suffocating or bitterly cold. When you pack, be prepared for changes from day to day - some days may start out warm and sunny, then cool off, and you might require sweaters or jackets. Jackets with hoods are always a good idea. We recommend Natalie at Myriad Assistance. Their services include personally curated restaurant and booking services, recommended cooking classes and itinerary planning services. Simply contact [email protected]. I'm coming to Paris to celebrate a special birthday/anniversary/special occasion. What can you do to make my stay in Paris simply unforgettable? Paris is the perfect destination for celebrating special occasions, and an arrangement with a local concierge team that offers fee-based consulting services to help you customize your itinerary, organize tours, make special restaurant reservations and create tailored special excursions. Please contact [email protected] who will be pleased to help. One of the pleasures of visiting Paris is the wonderful shopping. You'll love discovering all of the fashion boutiques, from classic Haute Couture names to trendy new designers. Visit our Paris shopping guide for ideas of the must-see areas and to read about our favorite shopping streets, best Paris department stores, antique shops, flea markets and much more. One of the advantages of staying in the apartments in the 7th arrondissement is that you'll be just a stone’s throw from the "Triangle d'Or" - the home of Parisian Haute Couture. We carefully select apartments to be near the best shopping streets and open-air markets in Paris. Can you recommend some cooking classes in Paris? Yes, we have an extensive list of cooking classes and lessons in Paris ranging from exclusive cooking experiences with some of Paris' top chefs to family-friendly lessons for young children. We include detailed information about each one so you can find the perfect cooking class in Paris to fit your desire and experience. Learning to cook in Paris is a memorable experience, and we hope you'll consider taking a cooking class during your stay. We've put together a detailed list of many different locations where you can take French lessons in Paris. There are many wonderful possibilities for learning French in Paris, whether you’re a beginner wanting to learn this beautiful language, or if you’d just like to brush up on your high school or college French during your holiday in Paris - there are even options for advanced speakers wanting to hone their skills. Our Learning French in Paris page offers a thorough list of year-round and summer French courses for adults and children as well as conversation groups you can join around Paris. You can buy tickets for the metro at a ticket window or vending machine, which will work on the metro and on local buses. We recommend you buy a carnet (pronounced ‘car-nay’) of 10 tickets which are cheaper than the regular single ticket price. The apartments are located within 5 minutes of the closest metro station. Metro services run from about 5am until quite late, but it differs with each line. If you plan to use the metro a bit more, you can buy a travel pass called the "Paris Visite," for 1, 2, 3, or 5 days. Check online at www.ratp.fr - just click the little British flag on the top right-hand corner for English. Tipping in France is different from many countries. Rather than the obligatory 15% - 20%, a tip is a gesture of thanks for good service. Please see the advice about tipping on our blog here. Click here for information on Paris museums, opening hours, prices, buying a Paris museum pass, avoiding queues and more.